﻿ HuntingNut » Forums » Firearms, Shooting & Reloading » Gun & Firearm Discussions » Ruger Project - Shots Fired...finally! Ruger Project - Shots Fired...finally! Posted: Sat Dec 25, 2010 7:15 am Post subject: Ruger Project - Shots Fired...finally! What with the lousy weather and busy work schedule, I finally got a chance to shoot it. Weather was still an issue (17 degrees and snowy) but the suspense was killing me. The group consists of 12 shots off-hand at 30 yards with 6.8 grains of Bullseye pushing Lee RNFP bullets weighing 261 grains. No effort as of yet towards load development. Next step is to see how it can perform from a bench and longer distances...but that will definitely wait until much warmer weather! Merry Christmas and a safe New Years to all. Posted: Sat Dec 25, 2010 8:25 am Post subject: Re: Ruger Project - Shots Fired...finally! Can't complain about those results! Nice looking gun and group! Posted: Sat Dec 25, 2010 9:11 am Post subject: Re: Ruger Project - Shots Fired...finally! Very, very nice shooting. That gun sure is "prettied up" too - hard to believe it's that same revolver. Great job. Posted: Sat Dec 25, 2010 4:32 pm Post subject: Re: Ruger Project - Shots Fired...finally! Beautiful revolver! Very nice group! How did you stay warm enough to shoot that well? Posted: Sat Dec 25, 2010 6:47 pm Post subject: Re: Ruger Project - Shots Fired...finally! How did you stay warm enough to shoot that well? Made it a very short trip and bundled up warm! Of course it's only 50 yards from my house to my range. 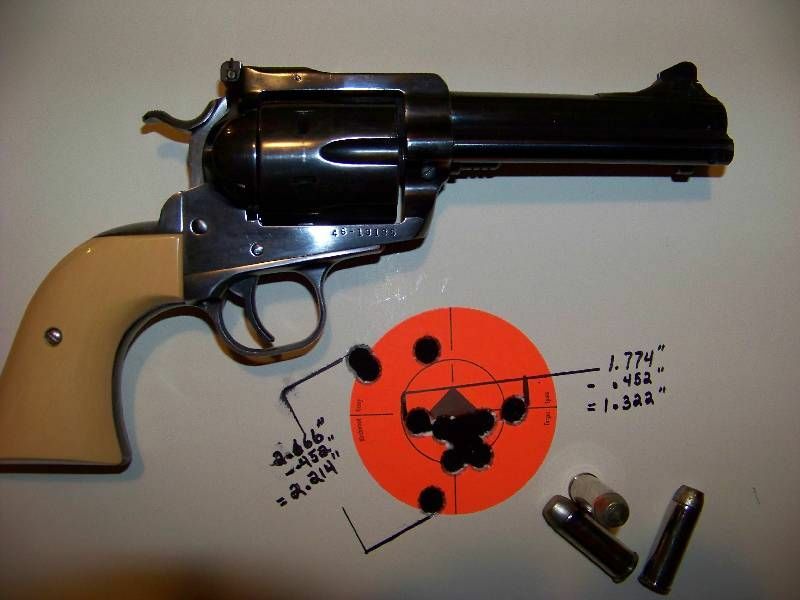 Posted: Sat Dec 25, 2010 7:02 pm Post subject: Re: Ruger Project - Shots Fired...finally! Wow - that's really roughing it. It's 50 yards from my front porch to my targets. Posted: Sun Dec 26, 2010 7:42 am Post subject: Re: Ruger Project - Shots Fired...finally! I've seen people that couldn't do that with their rifle. Fantastic gun and great shooting! Posted: Sun Dec 26, 2010 9:07 am Post subject: Re: Ruger Project - Shots Fired...finally! What everyone needs to remember is that that group just happened to be one of those perfect moments that happen to all of us at one time or another. It may not even represent what the revolver itself can do on a daily basis. I could reasonably expect a group like that from a bench, but all things just managed to come together at the right time. Next outing I may well be spraying shots all over the landscape. Quite honestly, I was surprised (though pleased) that it wasn't at least twice that size given the conditions. I'm certainly not going to try to fool myself and get hung up on the idea that I can do that every time. Posted: Sun Dec 26, 2010 9:38 am Post subject: Re: Ruger Project - Shots Fired...finally! Sorry, won't let you downplay it. Shooting like that takes some talent!